Nestled in the foothills of the Himalayas, the Punjab region of India is the leading food producer for the entire Indian subcontinent. Twice a year, in April and November, a thick layer of smoke covers all of north India, visible on NASA satellite photos, and descends on Delhi where it can bring the metropolitan area of more than 20 million people to a standstill. The smoke is caused by the burning of rice straw on the fields. MUSTS researchers Wiebe Bijker, Govert Valkenburg and Annapurna Mamidipudi collaborate with DSM-India in an NWO-funded project to explore the possibility of producing biogas from the rice straw as an alternative to burning it on the fields. The project is part of the Responsible Research and Innovation program of NWO. The project’s research question is: How can we provide for a system that balances in an ethically reflective way technological challenges with industrial interests and farmers’ needs in a context of resource scarcity? To address this question, values and interests of farmers, industrial partners and other stakeholders will be equally incorporated in a feasibility study of a scalable technology for using rice straw productively, and in the development of a system for responsible innovation that can deliver this objective. In November 2016 a stakeholder meeting was organized in Chandigarh, Punjab, with farmers, activists and policy makers to investigate the background of this rice-straw burning and to explore possible alternatives. The input from the farmers led to rethinking the original problem definition. For the farmers, burning is a solution rather than a problem. They feel forced by the government to produce up to four different crops every year. They have only 3 weeks after harvesting rice to prepare the land for sowing wheat. To get rid of the rice straw in such short time, most farmers see no other solution but burning it on the fields. Organic farmers, however, recognize that burning removes important nutrients from the soil, and for that reason have developed various alternatives, both high-tech and low-tech, but only on a small scale. Although biogas production seems currently not yet commercially viable, potential solutions may be found by adapting the business plans: by changing the ownership model of the plants, or by creating more outputs such as waste sludge, which can be processed into fertiliser to help return nutrients to the soil. Such ideas have the potential to offer profitable solutions for all. These stakeholder conversations thus shifted the research agenda from biomass to a broader definition and thus bring new solutions within sight. The project continues into 2017 with more attention to the science and technology side of the issues. The policy brief written based on the research of the project is available for download. Chandigarh, Nov 30: Straw burning is a much more serious problem than just being seen as adding to air pollution. The impact on soil health is a major concern, especially in states like Punjab and Haryana which are already reeling under the fallout of intensive agriculture, concluded an international conference that ended here today. “This conference organised as part of a Maastricht University research project on Responsible Research and Innovation has been exploring all facets to the issue of straw-burning. We are also dialoguing with all important stakeholders so that a comprehensive understanding of the issue could emerge, and also a multiplicity of sustainable solutions. It is clear that farmers, state and central governments, regulators, scientists of different disciplines, technology providers, social businesses and others have an important role to play here, to resolve the problem. One of the main things that emerged was that given that soil health has to be revived too, the problem of straw burning can be converted into an opportunity for ensuring that biomass goes back in direct and indirect ways to get back to reviving soil life”, said Prof Wiebe Bijker, professor of science, technology and society studies in Maastricht University, The Netherlands. The Seminar was jointly organised by Maastricht University with Kheti Virasat Mission and Centre for Sustainable Agriculture, Hyderabad. It brought together more than 40 participants including farmers (including organic farmers and representatives of large farmer unions), academics, scientists, bankers, social entrepreneurs and others. Devinder Sharma, noted agriculture policy analyst said, “The problem of straw burning is indeed a serious one and is related to monocultures and mechanisation that came with Green Revolution. However, it is clear that criminalising farmers and depending mainly on punitive action is not going to solve the problem. Governments have a responsibility of engaging farmers in serious dialogue in understanding and resolving the problem”. Kavitha Kuruganti of Alliance for Sustainable and Holistic Agriculture (ASHA) added: “We also need the governments to invest on several pilots since some grassroots solutions are seen to be emerging, both in terms of farm level practices and community level bio-gas plants etc. Special incentives are required for cultivation of pulses, oilseeds and similar other crops on a per acre basis”. Umendra Dutt of Kheti Virasat Mission, one of the organisers, added: “we find that none of the organic farmers in Punjab and Haryana indulge in straw burning and promotion of organic farming itself is a sustainable solution to the problem. MNREGS should be used and innovative pilots like Food Security Army as set up in Kerala can be deployed here”. 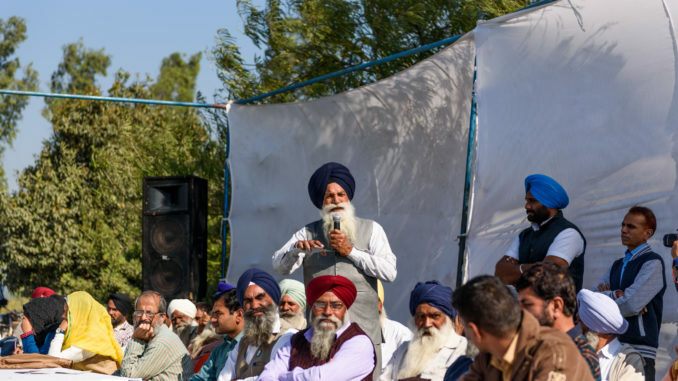 It was also decided to hold a dialogue with leaders of farmer unions from Punjab to find a solution and also to engage the farmer organisations in educating fellow farmers on sustainable practices that do not lead to stubble burning. Participants also visited a Bahalwar Pur village in Patiala district on Monday to have a dialogue with farmers about the problem of stubble burning and the consequences emanating. The recommendations emerging from this international seminar would be presented to the Punjab State Pollution Control Board as well as the State Government.